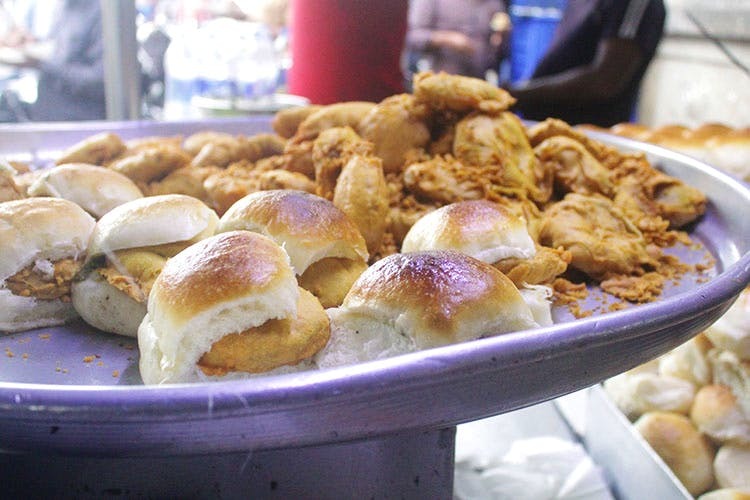 If you ever think that the vada pav culture is a tad bit overrated in Maharashtra, you are yet to visit the legendary Garden Vada Pav stall at Butte Street in Camp. Always bustling with people, this food joint sells close to about 2,000 vada pavs a day, and has been an unbeatable local fave since 1972. Located opposite JJ Garden, the wait for your turn at this little cart, amid a sizeable crowd, is absolutely worth it. Priced at INR 15, the vada pavas are made of delectable spiced potato fitters, sandwiched between a soft pav bread, coated generously with spicy and tangy chutney and served with fried green chillies. It is said the Garden Vada Pav’s claim to fame, was in fact, this famous green chutney. Wash down the piping hot snack with a glass of masala taak, which is buttermilk topped with coriander and cumin powder, for INR 10. The place is fairly hygienic, and is perfect if you’re looking to eat something light for your lunch. Although Garden Vada Pav stall operates between 9 am and 10 pm, we recommend you visit the place between 11 am and 2 pm to avoid a massive queue.